Contractor vest-style, contractor-grade full body harness with back and side D-rings for fall arrest and positioning. Built with our standard-duty 6,300 lb. polyester webbing for long life and an added measure of safety. •Three D-rings (back and side). 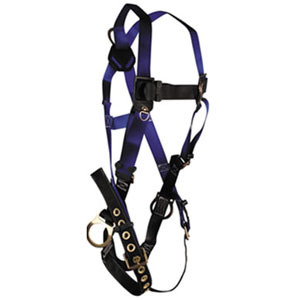 •9-position tongue buckle leg straps. •6,300 lb. heavy-duty polyester webbing.